It’s not usually difficult to recognize that our feelings are hurt. It’s knowing WHY they’re hurt that proves to be the more difficult task. Our emotions can be a bit like a Texas tumbleweed—a tangled mess of all sorts of emotional reactions that have gathered into one large ball as they blow across our inner landscape of worry, stress, anxiety and more. Tumbleweed is an annual that germinates in the spring and produces a verdant ground-cover plant ornamented with tiny flowers. In early life its leaves are tender enough to provide sustenance for livestock, but they soon grow spiny and inedible. 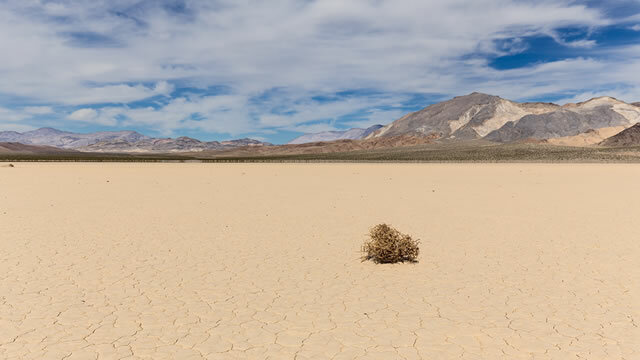 By the time it is full-grown, the tumbleweed holds tens of thousands of ripening seeds. Many of them fall where the plant is rooted, but many more are still attached when the first sustained winds of fall come and break the tumbleweed off its thin stalk and send it drifting across the plains. These remaining seeds will either be deposited along the way or remain with the tumbleweed when it falls into a ditch where the wind cannot reach it or snags against a fence or some other obstruction. In the vast Western landscape, tumbleweeds can be an absolute menace. They crowd fences, rob the soil of needed nutrients, scatter unwanted seed, and even act like traveling fireballs across the dry Texas landscape. What’s interesting to note, however, is that in their early life, tumbleweeds appear to be good and nourishing, but any farmer who has spent time out on the Texas prairie knows the truth about these masquerading plants: Do not be fooled, they’ll tell you. Tumbleweeds need to be eradicated the moment they appear. The same is true in life with our inauthentic emotions. When an inauthentic emotion first appears, everything about it feels right. Blame protects us from putting our trust in the wrong things. Outrage medicates the deep hurt of betrayal. Shame protects us from making the same mistake again. Guilt ensures we do the right thing next time. The power of inauthentic emotions—much like a tumbleweed—is that they “nourish” us long enough to take root deep within our minds. By the time we’ve even become remotely aware of what is going on, they’ve established themselves as permanent fixtures in our emotional landscape, keeping us stuck in a perpetual loop of emotional suffering. And once this happens, it takes serious work to contain their destructive influence on our consciousness, never mind our happiness. The first step is to recognize inauthentic emotions before they have a chance to wreak havoc on your life. Fortunately, this task is easier than you might think, when you know what to look for. Inauthentic emotions tell detailed stories about your experience. That churning in your mind, the hurt played over and over again on repeat, the attempts to explain and understand why someone could be so hurtful—it all feels really justified—even good—in the moment, and here’s why: Our minds were created to identify and escape the biggest threats to our survival. Find an escape and you just might survive on the ancient savannas, where you’re just as likely to be the prey as you are the hunter. Don’t and, well, you know the drill. . . When we experience great emotional pain and disappointment, it’s actually a pretty natural thing to launch into instant problem-solving mode, but very rarely do we wind up ahead when we succumb to those natural tendencies. The dilemma here is that focusing on getting rid of the problem takes our attention away from the only thing we actually have under our control—ourselves. We lose sight of the how and why of our own emotions and instead launch into a state of hyperawareness over all the times something like this happened in the past. And while that might feel good in the moment, give yourself a few hours, days, or even years, and you’ll realize that all you’ve really done is made yourself a willing hostage to emotional reactions that are experts at doing one thing: twisting the truth into a pretzel and then fuelling distorted, impractical solutions that propel you straight for the ditch. What’s the alternative? Give yourself permission to step off the hamster wheel of your story about the past. When you recognize that the narrative inside your head is there to keep your senses on high alert, you’ll also begin to understand why this state of mind doesn’t lead you to clarity. Think about it for a moment: When a bear is chasing you, you don’t need to understand WHY the bear is chasing you. You just need to get the hell out of there! Emotional pain can’t be so easily escaped. We can’t run away from our heartache, but because or brains don’t understand this, we can easily be caught in a perpetual loop of panic and alarm, as our brains keep urging us to react to the signals of danger. Focusing on the breath also relaxes the body. Spending just a few moments focusing on your breath and physical ease interrupts the loop inside your head and makes room for clarity to move in and show you a new perspective on your emotions, firstly, that the danger to your long term best interests is actually your reaction itself. Inauthentic emotions love to place blame. Regardless if you’re placing it on yourself or on others, your reactive mind will immediately encourage you to place blame, because if you can blame someone or something for your situation, then you’re solving the problem (or so the distortion goes). But if you’ve ever experienced a deep emotional wound, you know the truth: Placing blame (whether deserved or not) rarely ever helps. Pain doesn’t disappear just because we have someone to blame. You may experience this blame as shame, believing that you aren’t worthy of love or that you’re a perpetual mess up. Or you may witness blame surface as outrage as you verbally explode at a coworker for missing a deadline that caused you to look bad in front of your boss. The problem with blame is that it prevents us from taking an honest look at our fears and issues. For example, if a relationship fails, you’re first reaction is to attribute it to being unloveable, when the underlying fear is that you’ll never find the one. Your coworker missed the deadline, but the real cause for your reaction is more likely to be rooted in your fear of not measuring up. Calm down. This is your first priority. Once your emotional tsunami is launched, you only have one viable option, and that is to wait out your wave until it settles down. You can really help yourself during the turbulence by using the practice of posture, breath and mind. Slow down. Don’t be in a rush to judge, speak or act. Wait until you’re able to see your options clearly. When you’re reacting, you won’t see anything but the illusion of escaping by destructive means. Resist making a premature decision. Acknowledge that you don’t have to respond immediately to any difficult situation. What am I making up about the other person’s thoughts, motives and intentions? What am I making up about what will happen as a result of this? How are my long-standing issues and fears about the past magnifying this present-time threat? Here’s the good news. If you’re able to ask these questions, you’re not mired in your reactive mind. If you can wait long enough to be clear about the answers, your choices are guaranteed to be better than the ones you would make while your emotions are roiling and your mind is barking out ill-considered solutions that don’t solve anything and just make everything worse. If you want to learn more about inauthentic emotions, head over to my podcast. I’ll share my own journey working with blame, shame and guilt, and the tools I use to interrupt old habits and redirect my attention towards more constructive, authentic emotions. Worried About Your Chronic Worrying? What is self-awareness? How do you achieve it?